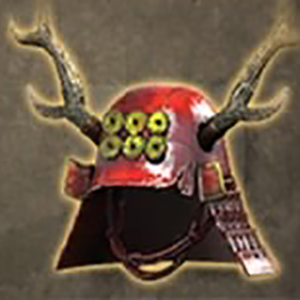 Scion of Virtue's Armour: Kabuto is a Head Armor in Nioh. "This head-shaped helmet is painted with red lacquer and adorned with deer antlers on either side. The front crest features the six coins of the Sanada family insignia that represent the toll one must pay in order to cross the river to the afterlife. This traditional armour was owned by Sanada Yukimura, a warrior who went from exile in Kudoyama (present-day Wakayama prefecture) to Osaka Castle where he fought courageously against the Tokugawa forces. Yukimura's troops were outfitted head to toe in red armour, both to strike fear into the enemy and to pay homage to the fallen Takeda family, whose army also wore all red. Just like his father-in-law, Otani Yoshitsugu, who died heroically in the Battle of Sekigahara, Yukimura never once colluded with an enemy."